When I bought my Ericson 30, it was probably a "50-footer", meaning that from 50 feet away it looked wonderful. Inspected at closer range, flaws were apparent. The cover photo on this blog is from the "50-footer" era, taken not long after the purchase. Today, looking at the deck and cabin, it's a five-footer. In this and a series of upcoming posts I'll tell what I did. There were some simple tasks. Tape residue from the prior owner's varnishing project had turned into hard, dirty streaks along the wood trim in many places on the cabin, deck and cockpit. The cure was a can of acetone and a lot of rubbing. I'm a little ashamed to admit how long I was able to ignore that task in favor of the mechanical repairs and upgrades that I found more interesting. There were clear indications inside the cabin that several of the chainplates for the shrouds had leaked, or were leaking. Those chainplates are crude by today's standards. The are simply stainless steel tangs fiberglassed into the hull and protruding through slots cut in the deck. A stainless cover plate secured with a small sheet metal screw at each end serves as a lid to contain caulking compound forced down around the tang. It was an easy, and early fix. The first "messy" repair was to the cockpit sole. The Ericson 30 cockpit, deck and cabin house is a fiberglass sandwich containing a balsa wood core. In the cockpit, water seepage where the rudder shaft entered the sole had rotted out the balsa core surrounding the shaft housing for a distance of 8 to 12 inches. The first step was to cut out the upper layer of the sandwich -- the cockpit sole -- around the shaft to remove as much of the soggy debris beneath as I could reach and allow the area to dry thoroughly. Then, using West System epoxy, I filled the area with a solid epoxy paste that also served as a glue to fasten back into place the section of sole that I removed. The products were West System 105 epoxy resin, 206 slow hardener, and 406 colloidal silica to make the filler. Prior to making this repair, I didn't know whether the balsa core had been waterlogged from seawater coming up through the rudder shaft housing, or water collecting in the cockpit because of clogged scuppers. 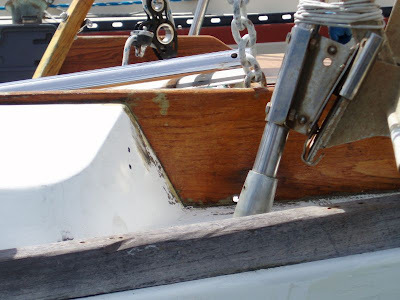 One reason was that a decorative teak block covered the rudder shaft exit, as evidenced by the four holes in the sole with which sheet metal screws attached it. I did not reattach the teak block, which provided pathways for water to reach the balsa core through the screw holes. Since then, I have never had water intrude into the cockpit through the rudder shaft housing, so all the damage was from freshwater. A larger area of the cockpit sole, especially aft of the rudder shaft beyond my reach from the top down fix, was still soft. I later fixed that by drilling 1/4-inch holes up into the core from beneath, digging out the soggy balsa remnants with a bent wire made from a clothes hangar, sucking the debris out the holes with a wet-dry vacuum, and giving the area several days to dry while a fan directed fresh air from beneath the cockpit. Then I mixed more West Systems epoxy filler, and pumped it into the holes using West's plastic caulking gun tubes and a caulking gun. The process was to squeeze in the epoxy paste until it began to ooze out of an adjacent hole, then move to another hole and continue. I drilled several dozen holes, spaced about two inches apart. Periodically while the epoxy was oozing, I wiped it off the underside of the cockpit. The underside is easily accessed from the starboard cockpit locker, which is large enough to easily contain me. I did make sure that I had fresh air blowing into the area while I worked. And when I climbed back out of the locker, I made sure that I didn't step into the cockpit. A day later the epoxy was hard and so was the cockpit sole. As can be seen in the photos, however, the cockpit sole wasn't pretty. The nonskid surface was traced with numerous narrow stress fractures. The entire deck and cabin top surface was that way, presenting a complex repair problem which I pondered for many months.